Joseph is a Boy Scout! We have come a long way together since the diagnoses of autism, ADHD, static encephalopathy, cerebellar deficit, and mixed expressive/receptive language disorder seven years ago. Just shy of Joseph’s fifth birthday we finally got the proper diagnoses, which were nothing less than shattering to my wife and me. All we had to cling to was our faith and one another. But after adapting the very rhythm of our lives to Joseph’s needs he has progressed beautifully, and tonight at age eleven he became a Boy Scout. He decided to join the troop of a friend from sports. Per usual, with new steps up socially I was anxious that the experience be a positive one. Not quite sure how Joseph would respond to the boys, or the boys to Joseph, we entered the hall. The older scouts working on their last and highest rank, Eagle Scout, immediately brought Joseph before the troop and had him introduce himself. The boys (some 30-strong) gave a hearty “hi”, and immediately pulled him into the activities of the night. I sat and watched as they showed him the scout sign, scout salute, scout handshake, knot tying exercises, scout oath, scout law, etc. They were the embodiment of the goodness, decency, and leadership that are the hallmarks and endpoints of the scouting program; just as it was when I was a scout, only these boys were better. None of the boys know about Joseph. From the goodness and warmth they lavished on him tonight, I doubt that they could have been any different had they known. These aren’t just any boys. These are scouts. These are boys who submit themselves to discipline and the commitment of citizenship and leadership. They are a breed apart, and always have been. Many will become our next generation of military officers, astronauts, business leaders and clergy. But all along the way we have encountered nothing but goodness and kindness, decency and love, acceptance and words of encouragement from people. None of my worst fears, or even my mildest fears have materialized. Quite the opposite. People are so very accepting of the Josephs today. This is NOT my parent’s generation. This tsunami of autistic children has brought right behind it a tsunami of love and patient forbearance in society. Everyone knows someone with autism. Speech and occupational therapists, special education teachers work miracles daily as a matter of routine. Down syndrome kids benefit every bit as much from these modern miracles at overcoming neurological defect. We live in a golden age. With so much hope, so much healing, so much acceptance, there is truly little to fear. The only caveat is the pro-abortion nihilists whose black hearts lead them to manipulate parents’ worst fears when they receive the results of genetic testing. They’ll never tell Joseph’s story, which is the story of thousands and thousands of autistic spectrum children and Down syndrome children today. We must do so, and so I am today. When we left the meeting, I wondered if the boys sensed a difference in Joseph who just seems a bit shy now. If they did, it didn’t matter. These are, after all, Boy Scouts, and they live their oath and their scout law. These boys stood tall as men tonight in the way they welcomed and embraced a new kid, and they’ll never know how high they made a father’s heart soar as he saw his special son embarking on his training in honorable manhood as just one of the guys. With such mentors and guides outside of the immediate family, how can Joseph do anything but succeed? And that is the good news, the message of hope that we need to trumpet in our witness to life. on October 30, 2010 at 1:49 AM L.
Unfortunately, the Boy Scouts are not so tolerant and accepting of athiests and homosexuals, which is why I made the unpopular decision in our home that our sons would not join, despite their wishes to do so. What if they turned out to be gay? They would get the boot, immediately, no matter how many merit badges they had. What if they decided they don’t believe in God? That would cause problems. And our family has enough problems, trying to be Catholic. However, I believe a private association has the right to include (and exclude) anyone it deems fit. I have no problem with that concept — it’s just not a great fit for our family. However, I think the Scouts do lots of good, and I’m very glad to hear, Dr. Nadal, that your son was warmly accepted. It sounds like a good fit for him and your family. on October 30, 2010 at 2:24 AM L.
Never mind the other stuff — it was just me, thinking out loud, unedited, and I don’t want to spoil the warm friendliness of the original post. No problem L. I think you’re one of the great denizens here. I take no offense! on October 30, 2010 at 7:24 AM Russell Rentler, M.D. Thank’s for sharing this, I am glad to see your son has been warmly welcomed by the scouts. Autism is very much out there and affecting many. Both my sister and my cousin are parents of children with autism. It takes a special person to be able to receive this challenge. Your son is blessed to have such good parents! A warm and hearty congratulations to Joseph for his milestone! God Bless you all! This is such a sweet blog – Blessings to you, your wife and your wonderful young man, Joseph! Congratulations to Joseph! What a wonderful achievement. on October 31, 2010 at 10:28 AM L.
Oh, Mary Catherine, there’s no time like the present! There are great things to stand for. But the one thing that will matter for eternity is standing for God, Jesus Christ and the Holy Spirit. You certainly display in your life that you indeed uphold the standard of living for the Holy One. The bible tells us to not be yoked with unbelievers and a list of those if we can’t figure it out. I applaud Boy Scouts for standing with the Lord. Anyone who agrees with Atheists, homosexuals and those who blatantly rebel against God will be on their side when they see their Holy Creator. Not a good thing. Loving them does not mean you let them face eternal hell and joyful ignorant bliss on earth. Eternity IS forever! God bless you Gerry and I am praying that God get all the glory in your son -healed and perfect! Oh huge Congratulations to Joseph! May He see God’s hand in every action he performs! Great job to you and your wife as well. Good for Joseph. I remember older boys teaching us how to build bird feeders, and how we looked up to them and they had a good time teaching us. Unfortunately, the Boy Scouts dissipated in my little home town as the population of kids dwindled. How I wish I knew how to tie all those sailors knots! I hope Joseph makes it far in Scouts and builds good memories. on October 31, 2010 at 6:17 PM L.
Thank you all for your kind regards and warm wishes. On my honor, I will do my best to do my duty to God and my Country and to obey the Scout Law;To help other people at all times;To keep myself physically strong, mentally awake, and morally straight. Admission of atheists would make a farce of that oath. Simply stated, one must believe in God and be willing to to do one’s duty to God as revealed in their religion. Admittedly, that duty arises from Judeo-Christian morality, which does not admit a homosexual lifestyle as either morally valid or licit. These qualities are expected without qualification, and though the scouts do not admit atheists or homosexuals whose lifestyle choices and beliefs place them outside of the orb of scouting’s moral compass, a scout is nevertheless bound to be friendly, courteous and kind to all. In the faithful adherence to that law it is not possible for scouting to foster homophobia or other noxious beliefs and treatment of people whose lifestyles place them at odds with that of scouting. I feel sad for you that you felt you just had to come here and make a political statement about something that was decidedly personal and about a young person striving to achieve a personal milestone. Dr. Nadal, ever the gentleman, took the higher road (as have the Scouts). on October 31, 2010 at 11:04 PM L.
Mary Catherine, do you see anything incongruous in criticizing someone for marring the tone of a personal post by stating a related by not directly relevant opinion… and then turning away from the tone of the post yourself, to continue criticizing this person with increasingly harsh words? 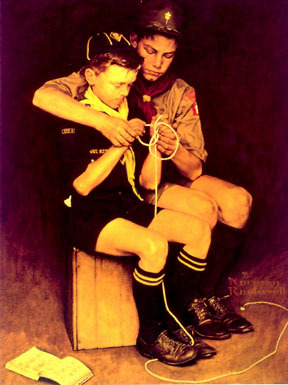 The Boy Scouts, from what I’ve observed, do have a similar “hate-the-sin-but-love-the-sinner” mentality, but because they ARE a social/service/community organization, they do revoke membership for those who don’t claim to live by their requirements — as well they should, as a private group. on October 31, 2010 at 11:29 PM L.
If I may a share a similar story, ten years ago, my now 13-year old daughter attended a Japanese public daycare facility. In her class was a boy named Taka-chan, who had DS. On the day of the annual sports festival, when it was Taka-chan’s turn to race, he was allowed to participate in his stroller (since he was unsteady on his feet). Instead of racing with him, all the children in his group got together and pushed his stroller first, over the finish line. They did this spontaneously, with no instruction from the teachers.